XpertMart™ has a Time Clock feature that lets you track the attendance and productivity of your employees. The time clock feature works a lot like the old punch cards that tracked time in and time out for employees with the added advantage that the data is saved in the database allowing you to run reports. The first step before using the Time Clock feature is to make sure there is an entry for every employee in the Employees Catalog. 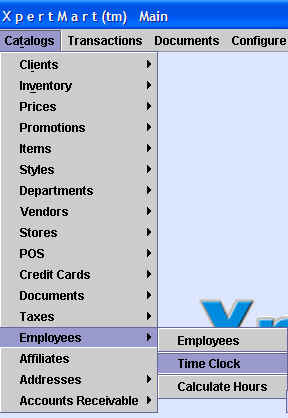 In the Employee Catalog you can assign each employee an Employee Number, Login and Badge Number. You can configure the Time Clock to determine which of these three fields you want to use when employees punch in and out. The configuration settings are found in Configure>Station Configure>Time Clock and are shown below. You can also determine whether an employee will be prompted for their password when they punch in and out. This makes it harder to have other employees punch and employee in when they are not really in the store. When an employee shows up for work they punch in. 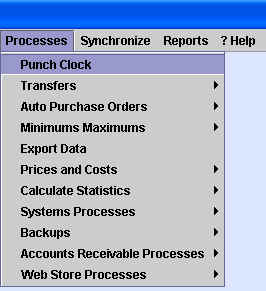 To do this they go to Processes>Punch clock, as shown below. This will open the Time Clock window which prompts the employee to identify themselves according to the configuration settings you've setup. 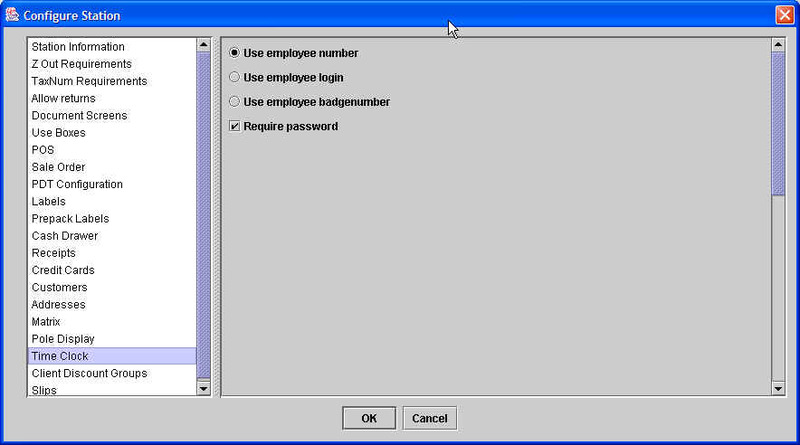 In the example below, the employee is asked for their Employee Number and Password. If the employee successfully identifies themselves, the system records the time in the Time Clock Catalog and also displays it in a window on screen. If the employee makes a mistake identifying themselves (such as typing in the wrong password) then a window will appear saying "No such employee exists" and the employee will have to try again. Employees punch out exactly the same way they punch in. They simply go to Processes>Punch Clock and identify themselves. Employees can punch the clock as many times as necessary. For example, an employee would punch the clock when they show up to the store in the morning, then they would punch the clock again when they leave for lunch and then upon their return they would punch the clock and again when they leave for the day. Along the way an employee can also punch out and in whenever they take a break. In a multi-store environment employees can punch the clock at any Remote location. All Time Clock data gets synchronized to the Main. If an employee starts their day in a warehouse and ends it at a different store, both sets of entries in the Time Clock Catalog will be recorded and sent to the Main. Any time the clock is punched an entry is made in the Time Clock Catalog. You can open this catalog by going to Catalogs>Employees>Time Clock. Each entry in the Time Clock Catalog records the employee, the date, the time and the store where the clock was punched. The Time Clock Catalog also has a non-editable checkbox called "Matched". This box is automatically checked after you run the Calculate Hours Worked process if the time stamp has been matched with another. Normally an employee will punch in and then some time later punch out. The system will assume that the first time stamp is the employee punching in and the second timp stamp is the employee punching out, and will match these two time stamps when you run the Calculate Hours Worked process. If there is a time stamp and no other time stamp within 20 hours then the system considers the first time stamp to be not be "Matched". The checkbox will not be marked. This will avoid having drastically inaccurate reporting of hours worked. For example: if an employee punches the clock on Monday at 9 a.m. and then doesn't punch the clock again until 9 a.m. on Wednesday, the system will consider the first time stamp to be unmatched and will not include it in the total hours worked calculation. The alternative is to assume the employee worked 48 hours straight which is illogical and throws all subsequent calculations. If you have an unmatched entry in the Time Clock Catalog you can correct this mistake (see below). Obviously the whole time clock process is thrown off if an employee forgets to punch in or out. For this reason, a lot of retails have very strict rules in place to make sure employees are diligent. Some retailers will not pay for a day of work if the person has forgotten to punch in/out or will only pay a flat rate, for example, 4 hours. The Time Clock Catalog also has an "Hours" field that displays the total hours worked for a Matched pairing of time stamps. If two time stamps are paired, then the system assumes the second time stamp is the employee punching out and computes the total hours worked when you run the Calculate Hours Worked process. NOTE: Hours are calculated using decimals and not minutes. For example, .10 hours is equal to 6 minutes, not 10 minutes. The system uses a decimal system in order to be able to multiply hours worked by hourly rate, and for other calculations. To figure out the total number of hours employees have worked in a period you have to first run the Calculate Hours process which is found under Catalogs>Employees>Calculate Hours. The Calculate Hours process is run at the Main, so it is important that all of your data from the Remotes be synchronized first. A window will pop up asking you for the date range you want to use. Select a date range that corresponds to the time frame you want to analyze. Typically this is a two week pay period. It is a good idea to run the Calculate Hours process at least once or twice a month. 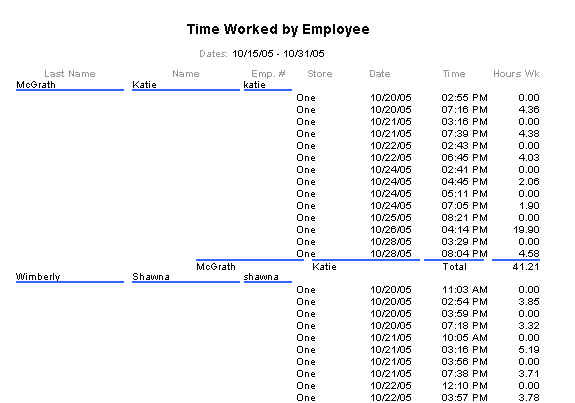 To see the total hours each employee has worked you can run the Time Worked by Employee report. Note that before you can run this report you must first run the Calculate Hours process for a date range corresponding to the date range for which you want to run the repot. The Time Worked by Employee report is found in both the Time Clock Catalog and the Employees Catalog. 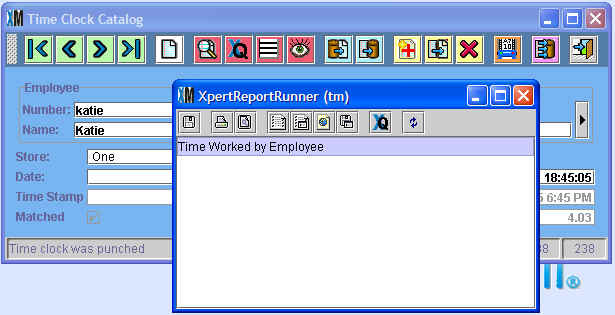 To run the report, click on the Reports button in the toolbar. This will open the XpertReportRunner window. Select the report and click preview. The Time Worked by Employee report shows the total hours worked by employee. The report also shows every chunk of time the employee worked during the period and includes the time stamp for the times the employee punched out. If any of the totals or subtotals look incorrect, it is likely that an employee forgot to punch in/out at some point. You will need to go to the Time Clock Catalog and correct any errors you see there. 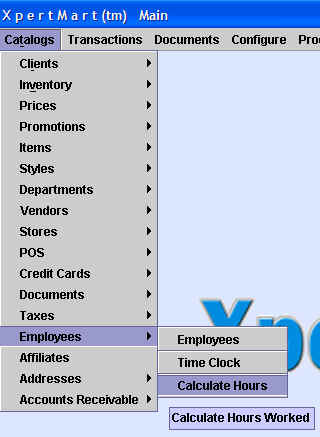 The Time Clock Catalog works like any other catalog in XpertMart™. Entries in the Time Clock Catalog can be modified at the Main by any employee with the right security permissions. This way any anomalies or mistaked can be corrected. The most common mistake is that an employee has forgotten to punch in or punch out. Before running the Time Worked report (and cutting checks for payroll) you will want to browse through the Time Clock Catalog and find any unmatched entries. Depending on your company policy, you will want to create a new entry in the Time Clocked Catalog that matches the orphaned entry so that a pair of time stamps is formed. The Employee Catalog has two fields that can be used to forecast the hours employees work and budget payroll expenditure. The Hours Scheduled field is an open numeric field you where you can enter the total hours the particular employee is scheduled to work. The Hourly Rate field lets you enter a dollar amount per hour that the employee works. With these two fields you can use a multi-query report to compare the actual hours worked (from the Time Worked report) with the Hours Scheduled.